Animal rights group PETA will protest a state bill overturning the ban on kangaroo skin sales in Santa Barbara on Tuesday morning, June 5. Accompanied by an activist wearing a kangaroo costume and holding signs reading, “Save My Skin,” PETA will be at the intersection of State and de la Guerra streets from 10 to 11 a.m.
After four years of heavy lobbying by Adidas and sport equipment retailers, the California Senate approved a bill on 5/29 to legalize the import and sale of kangaroo skins. 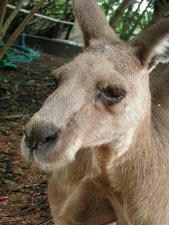 Bill 880 removes criminal penalty for importing those species of kangaroo that are not listed as federally endangered. Until now, California law prohibited the importation, possession, and sale of products made from kangaroo skin. Violators faced fines up to $5,000 and up to six months in jail. The ban, established in 1970, was passed in order to protect certain “look-alike” kangaroo groups so that Californians would not contribute to the extinction of a species. Supporters of the bill include the California Retailers Association, LA Galaxy pro-soccer team, and sports companies that argue the bill will still allow California to prohibit the sale of products made from kangaroos recognized as federally endangered. Soccer manufacturers and retailers blame the restriction for blundering sales, since kangaroo skin apparently makes for superior shoes. Opponents like PETA and the Humane Society argue that the purpose of original ban is not only to protect endangered species, but species that society determines should not be hunted for specific reasons. They claim legalizing kangaroo imports will create additional market pressure that will further deteriorate the kangaroo population in Australia. PETA points to the continuous dwindle of kangaroo populations, which are now reportedly well below half of what they were in 2001.